Here for you cookie eating pleasure, is another of my families very favorite cookies. We are all very fond of oatmeal. You can see in the ingredient picture my family cookbook. I have files on my comp that I keep updated with my families favorite recipes interspersed with family photos. On this page are pics of my maternal grandmother who found and first made this for us. The sharing of flavor and goodies has been a big binding factor in my family, isn't it funny what things can bring a family together? Beat butter in a large mixing bowl for 30 seconds, add 1 cup of flour, mix well, add sugar, eggs, vanilla, and soda. Mix. Add the rest of the flour then the oats. Press 2/3 of the mixture into an un-greased 15x10x2 inch baking pan. 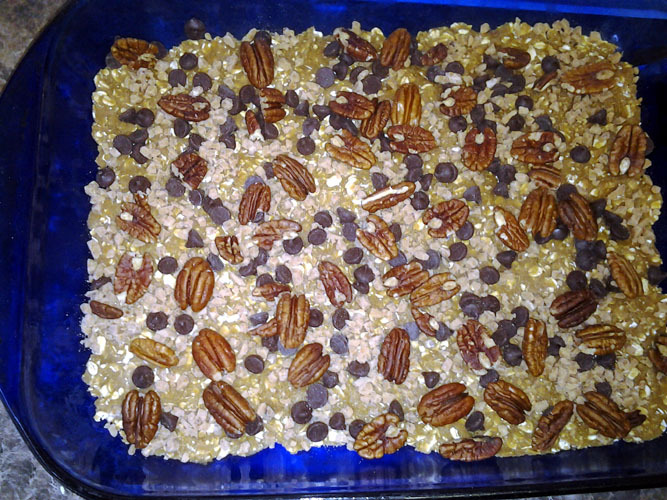 Sprinkle with chocolate chips, toffee, and nuts. In a Saucepan melt caramels with milk (I had leftover caramel from my last big batch of homemade caramels so I just used that). Drizzle caramel over chocolate and nuts. Drop the rest of the dough by spoon fulls over the top and lightly pat down. Bake at 350º about 25 min. or until top is light brown. For Travel: cool the cookies completely and cut them into bars. Set in airtight container and refrigerate until ready to leave. This way they stay together and keep all the gooey caramel and chocolate to themselves till you eat it.